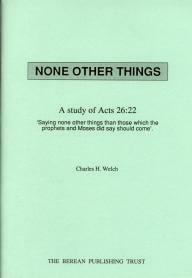 The phrase “none other things” is found in Acts 26:22 – “saying none other things than those which the prophets and Moses did say should come”. These words were spoken by Paul to Agrippa, and they are of great dispensational importance, as Paul was later on to speak of things not previously revealed to him or anybody else before him. This PDF booklet is a series of Bible Studies. Paul’s defence must be understood as literally true. The gospel preached by Paul was in accordance with the testimony of the law and the prophets. The inclusion of the Gentile in Gospel and Promise was never a secret. The Hope of the Church of the Acts still the Hope of Israel. The Gifts of the Spirit and the Abrahamic Promise. The Heavenly Country and Calling. The remaining mysteries of Paul’s early ministry, in light of the Apostle’s claims. Is the “Church” within the Law and the Prophets?